On my last project, I would bring a huge batch of these into work on Monday morning, and they would be gone by noon. Those who flew in later missed out, and I got requests to bring more each week. I adapted this recipe from a Vegan recipe I found on the internet at DAMY Health: quinoa-omelette-breakfast-cups. Prep time: 10 Minutes – Cook time: 40 Minutes – Total time: 50 Minutes. I use Quinoa in 2-3 recipes each week, so I like to cook a large batch of it in the rice cooker at the start of the week. I quickly assemble the other ingredients which I have altered over time to just the perfect combination of deliciousness, and toss them all into a bowl together! Once I have the quinoa, diced assorted bell peppers, red onions, egg whites whipped with 2 eggs, pancetta, salt and pepper combined, I stir it well and spoon into the muffin pan. Place eggs and egg whites in a bowl and whisk until blended. Stir in veggies, meat, spices, cheese and quinoa (all other ingredients). Spray your muffin tin with a healthy, non-stick cooking spray. 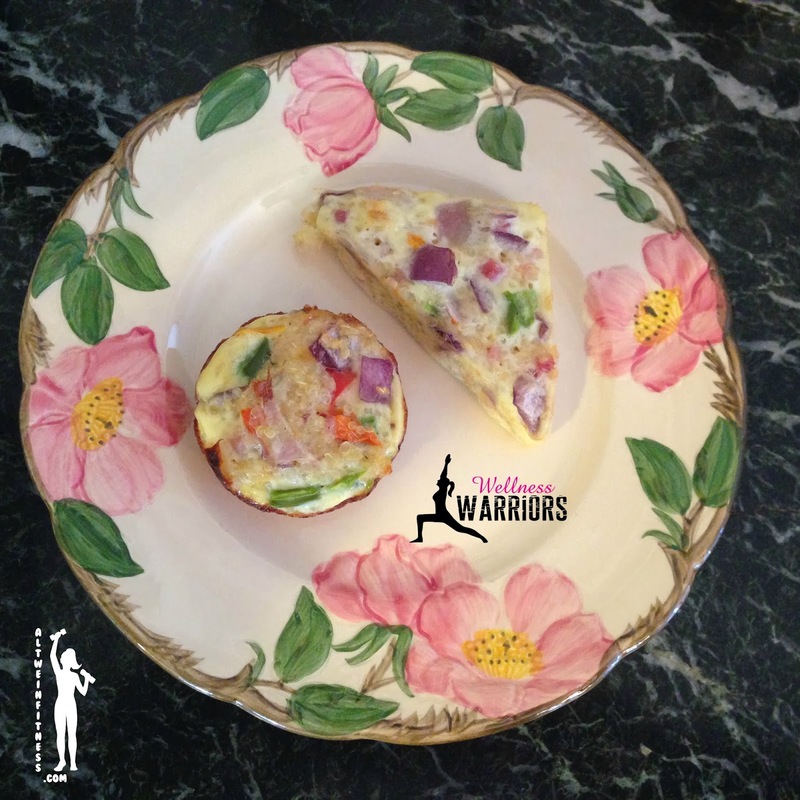 Scoop quinoa omelette mixture evenly into muffin tins. I had left-over mixture so I took a ramekin, filled it up with the rest and baked it alongside the muffins. It was the perfect breakfast to reheat for the next day. Remove from oven and let completely cool in muffin tin. Using a knife release the edges of the omelette cups and remove. I find the edges turn out a bit cripsier in a traditional muffin pan, which I enjoy, but the triangle shapes from the mini scone pan are rather pleasing to the eye. Visit my team on Facebook for more nutrition, fitness and healthy living tips. Are you looking for your body's reset button?